I went to the flea market Sunday midday. Wanted to go to the Eurocar/motorcycle show in Cazenovia but it would have taken up the whole day. I found 3 or 4 sockets that I needed to fill out some sets. As you can see I picked up a nice Plomb 1/2 combo. But the prize for me was this cheapo Wards 6" adjustable. I am building a custom motorcycle with a Wards Mojave as a starting point. This adjustable will be perfect for the onboard tool kit. It's made in Japan but maybe someone knows who made it? Numbers on it are "84-7314-6" and on the back"Drop Forged Alloy Steel". 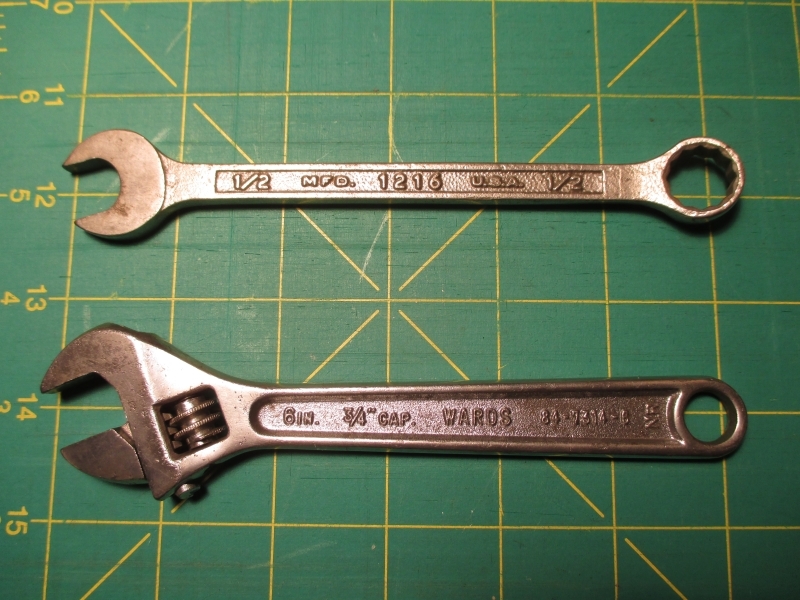 I have the exact same Wards adjustable wrench. I got mine as part of a 3 piece set when I was about 10 years old. My set was a Christmas gift from my parents, the adjustable, a pair of combination slip joints, and a pair of needle nose came in the set. I know I have both the adjustable and the needle nose, I think I might still even have the combination pliers too! My adjustable looks as a twin to the adjustable you showed. No idea who actually made them. In over 45 years of use they still perform as good as new and the plating still looks very good too. Thanks, Buck. I got my first wrench set when I was about that age. It was a Barcalo set of 4 and my Mom let me pick them out of an S&H green stamps catalog. Yes, I still have them but no longer use them. The Wards was a touch rusty but cleaned up easily. It has a smooth feel. 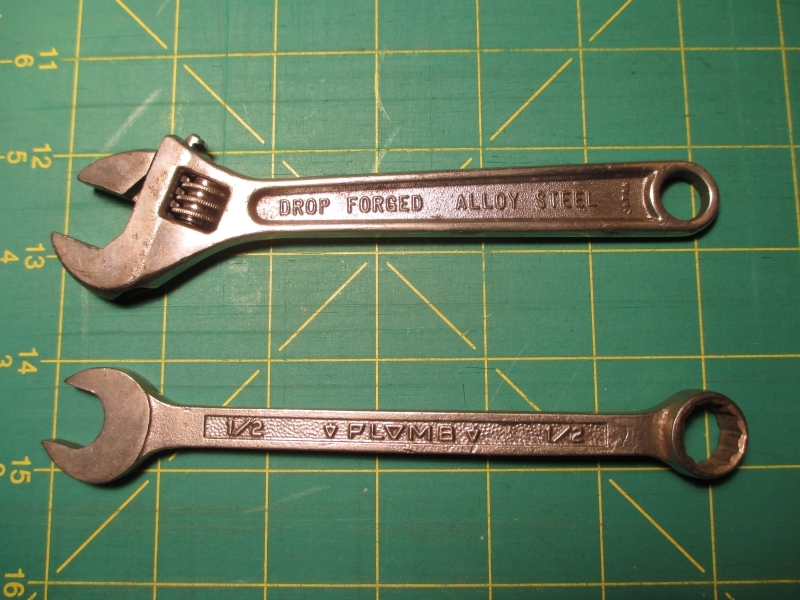 It is similar in appearance to a 8" Fuller (Japan) wrench that I use. I have a 10" Fuller japan which also looks very similar and if I'm not mistaken made by KTC ( Kyoto Tool Co.) Japan. amecks I got my first tool set also with S&H green stamps. I was living in Napa Calif as a teenager and we had no local S&H store in our town. I got on the Grey Dog bus and went South to the town of Vallejo which is about 15 miles away. I got a Stevens Walden 3/8 socket set for 5 books of S&H greens stamps if I am remembering correctly. This would have been the mid 1960's as I had just gotten my first car a 1955 English Ford Anglia. I paid a whole $6.00 for it and had to pay for it in two payments of $3.00 each. Bringing back some memories here. If it wasn't the S&H green stamps, it was the Top Value yellow stamps and if i had ever used my Mom's books i would have probably been tool-less.